Last summer I picked up my second KZ400. This one was a true basket case but only had a little over 17k miles. I got it cheap because it was in parts, in pretty rough shape, and there was some doubt if the owner could find the title. Luckily he gave me a call a couple weeks later saying he found the title along with a few more parts. The PO, a 17yo kid who got in over his head, had it running after he bought it but it had a pretty big oil leak from around the head. He disassembled the top end in his shed to replace the gaskets and fix the oil leak but he never got around to reassembling it. 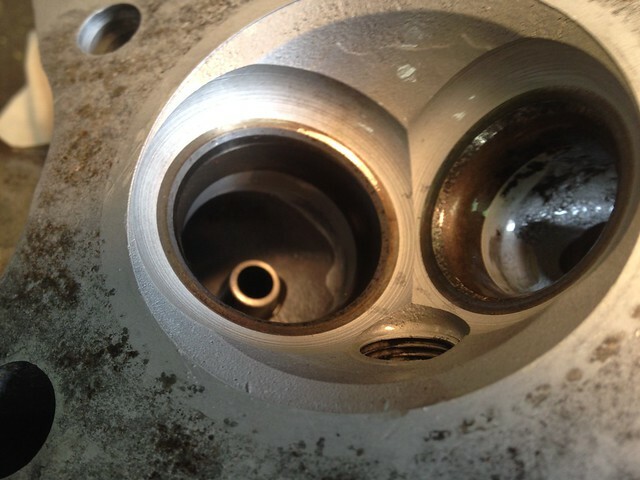 The cylinder bores look good. 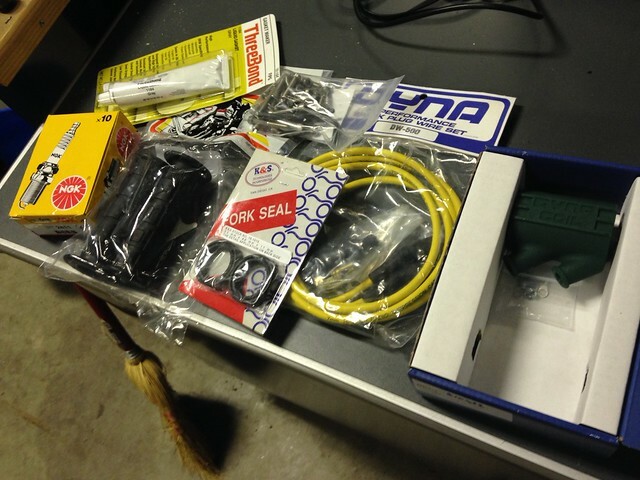 It also looks to have nearly all the parts though a lot of them will need to be replaced (cables, seals, etc). It is missing one side cover. The tank has a few dings and scratches but looks good overall with a nice patina and the inside of it looks really good. My goal is to build a scrambler, something that would look like it came from the factory in 78 if Kawasaki built KZ400 scramblers. Since the wheels were solid but ugly I ended up spraying them with truck bed liner for an economical coating that will suffice for the time being. If it gets chipped I'll just touch it up. 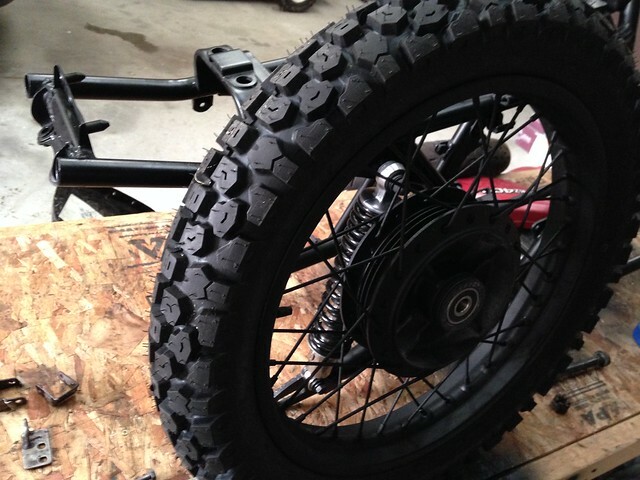 Tires are Shinko 244 Dual Sports. 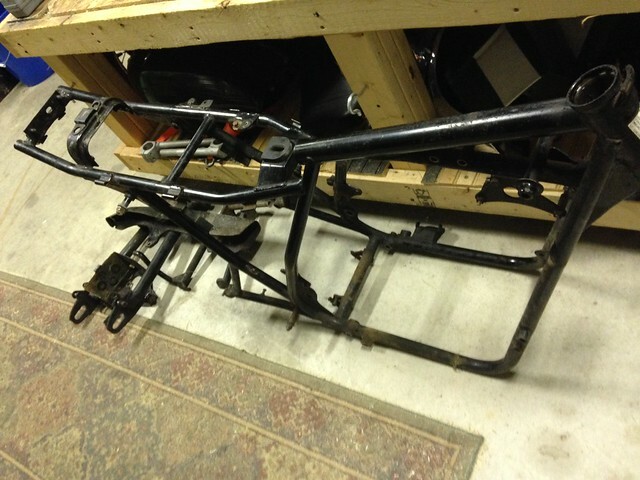 Frame painted with black satin chassis/rollbar paint. New bearings and seals installed everywhere. New fork seals and caps and added fork gaiters. New shocks - Girling repros/knockoffs. New Euro bars, a little wider than superbike bars with a little more pull back - should work well for some light offroading. 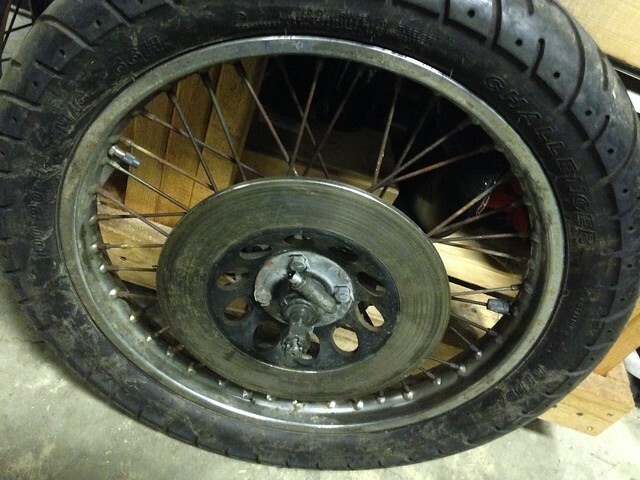 New sprockets installed. 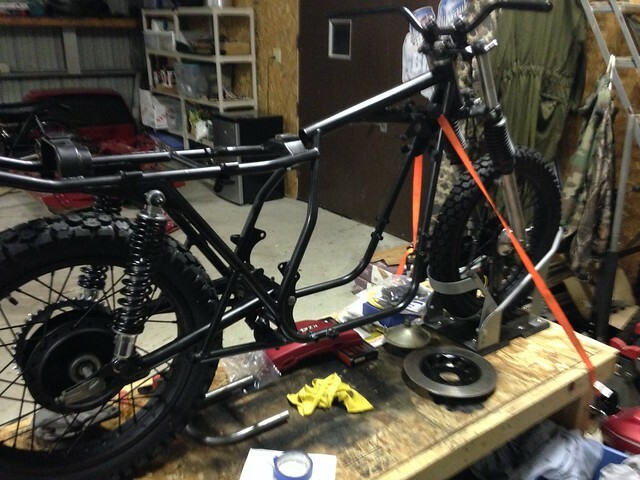 Rolling chassis is off the bench, engine is now on the bench. And that's about how it still sits now. 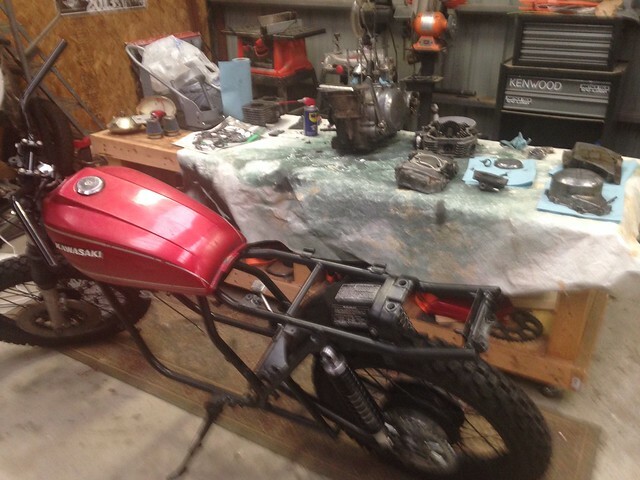 WIth plenty of projects to do around the house and the yard and trying to dial in carbs on my 76 KZ400 I have not had time to get back to this one. I'm hoping to soda blast the engine this weekend and start re-assembling soon afterward. I don't plan to do anything to the engine other than re-assemble it with new gaskets and o-rings (included by PO) since it has fairly low miles and the bores look good. I'll just lightly hone them. I'm not planning on a ton of customization with this one. 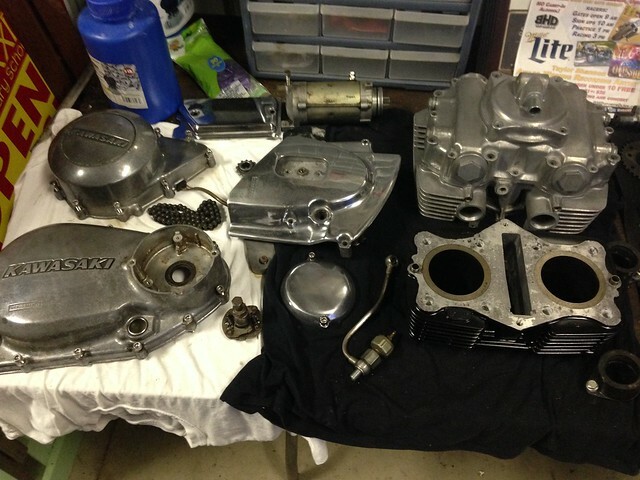 I may stick with the stock carbs or use the earlier piston-style carbs from my 76 KZ400 since I know they work well. 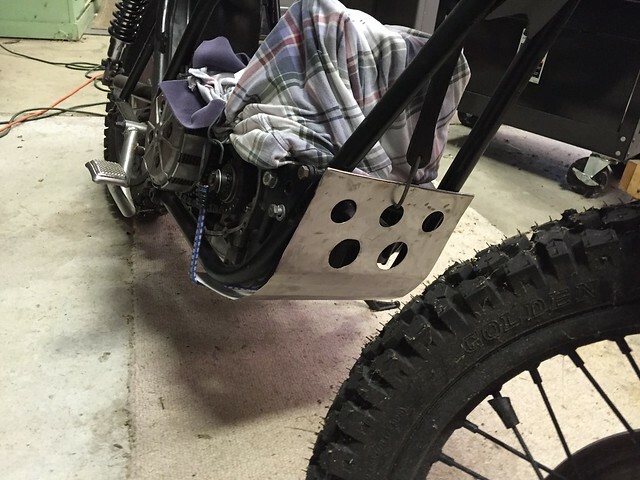 Not sure about what to do with the airbox yet. 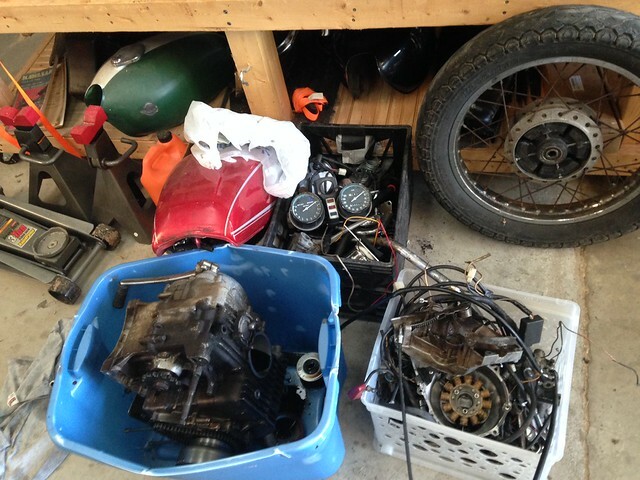 I will swap in an electronic ignition from the later KZ440s as I have plenty of spare parts that I've kept after making the same change to my 76. I'm not sure about the seat yet. I may keep the stock pan and just trim down the foam and have it recovered. I'll keep the tank as-is - love it. The only other major modification will be a custom exhaust with high pipe(s) and I'll fabricate a guard for the front and underside of the frame/engine. It has been a while since I've had a chance to work on this. Unfortunately I had previous updates on the KZ400 forum, which sadly does not appear to be coming back. Late last fall I pulled the ending out, degreased it and soda blasted anything that needed it (most of it). Looks a lot better. Found a surprise when I was checking everything out: someone has been in here before and did some porting on the head. I pulled the valves out everything looks good. I measured the cylinder walls, the pistons and the rings and everything is to the large side of the serviceable limit but it should work okay. There was a little bit of carbon built up on top of the pistons but overall it looked like it was fine (other than the oil leaks the PO mentioned). 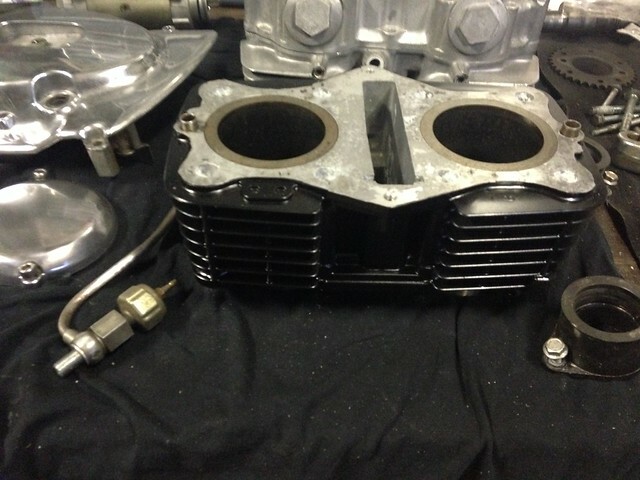 I honed the cylinders a bit, but the block back in the frame and prepared to put everything back together. ... and that is where everything sat until a few weeks ago. I decided it was time to start putting this thing back together, started dropping the barrels over the pistons and in my haste I ended up breaking the oil rings on both pistons. I ordered a new set that arrived this weekend and I have them in place. While I was waiting for the rings I began making a skid plate. Not sure how I'm going to mount it yet - original idea was to have bosses welded to the frame that I can tap for bolts. But I have another idea that I'm going to try first. Here it is mocked p with a couple bungee cords holding it in place. I hope I've built some momentum so I can get this thing wrapped up this year. Thanks for posting...I'm curious how this will look when finished. Have not had a chance to do anything since the last post but I did find a couple more pics on Flickr that I had not posted previously. Bottom end back in the frame after being cleaned. Head and covers cleaned up and waiting. Cleaned up, painted and ready to be installed. Replaced the rings because of the oil control rings that I snapped last time I tried to put the barrels on. The new ones spec'd out fine - no filing required. 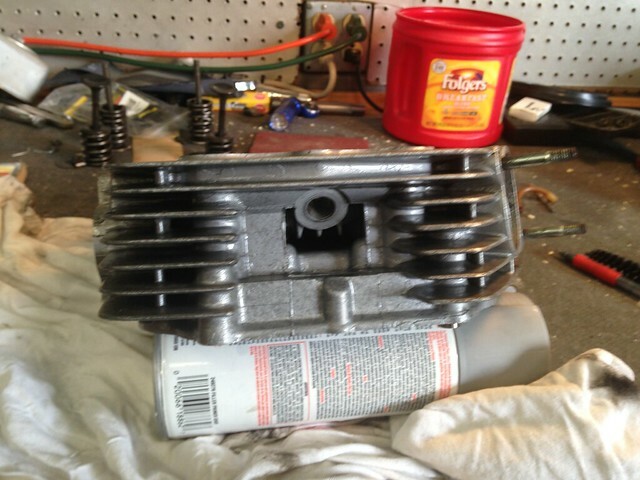 Jugs on, head on, and after this pic was taken camshaft was put back in place. Just need to finish putting the top end together and polish up the side cases a bit. Cool project. 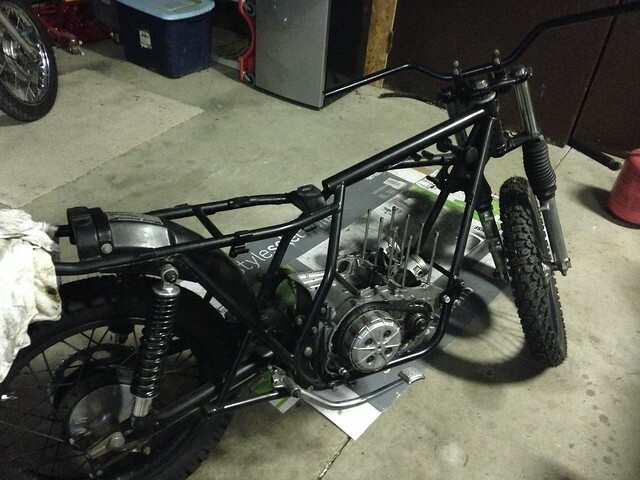 Too bad about the old KZ400 forum. I need to take the cover off my 400, blow off the spiders, air up the tires and flog it a little. It held a ton of knowledge that had built up over the years. I had read through a lot of it but I know not all of it. 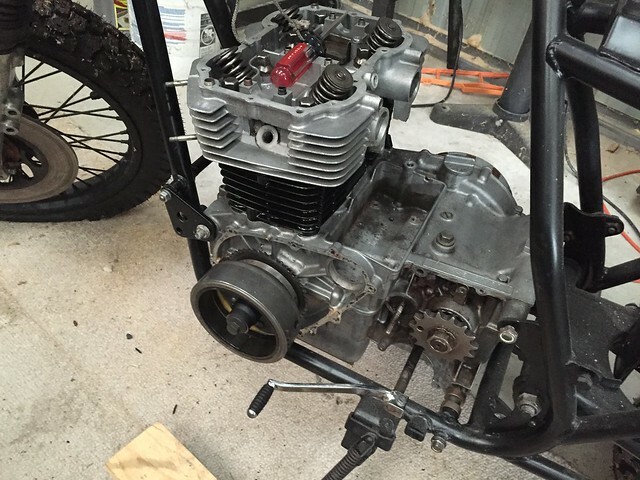 The worst part for me is when I run into an issue and think "I know I've seen the answer to this before" and then remember it was probably on the KZ400 forum. ThatGPzGuy wrote: ... and flog it a little. I hope someone can resurrect it, of if it would be possible to archive it and host it here at KZr. That was the absolute best resource for the KZ twins. If I knew what I was doing all the time life wouldn't be any fun. Thankfully kz400.com is still around, the forum is gone. There was a thread there on single carb conversions that was full of great information. Wish it was still active. Whip it like a mule! I had a KZ400 as my main transport for 30 years in India; well, 30 half years, I was only there in winter. One day, the oil pump broke, so while I was waiting for a new one I bought a yamaha rd350. When I got the KZ working again, I turned the RD into a dirt bike. They didn't have off road bikes there at all. It worked really well; except with the front forks out and the rear fork in, the seating position was too far back. I called it the Rice Burner; what Americans called Jap bikes back then, and I used to burn through [dry off season] rice fields with it. Front end from a Honda 550, rear shocks from an xt500, everything else custom fabricated. Last edit: by mark in Portugal. mark in Portugal wrote: I had a KZ400 as my main transport for 30 years in India; well, 30 half years, I was only there in winter. I think you will like this: it is a Maico 490 (two-stroke dirt bike) engine in a Honda Dream (?) frame. I once saw a flat 4 water cooled motorbike in Boston; I asked the guy what the hell is that thing? Subaru motor in a BMW he told me. Yes, Shinko 244 Dual sport tires. 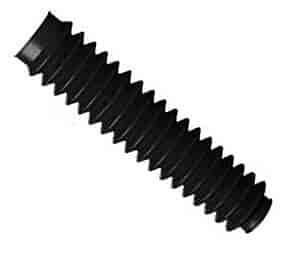 3.00-18 front, 3.50-18 rear. I drive a turbocharged Jap car.